Yale/Stanford LT (Bobbi Leet, Marina Tan) have won Cambridge Women’s Open 2017 on the motion that “This house regrets the idealisation of motherhood” from Closing Opposition. 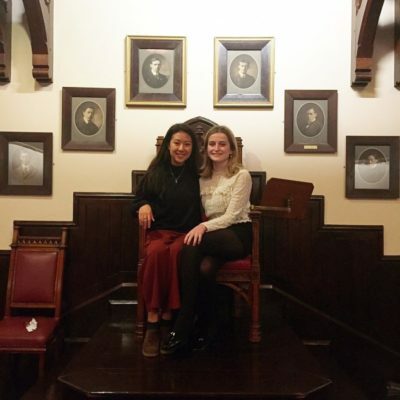 In Opening Government was Bad at feminism motions but trying (Lucía Arce, Rachel O’Nunain); in Opening Opposition was LSE sarah or yings (Sarah Tay, Ciara Mitchell); and in Closing Government was the accurately-named More Women Here than in Oxbridge Finals (Melda Eren, Valerie Lim). Judging the final round was a panel of Rebecca Meredith, Gillian Tiley, Bexley Brown, and Doireann O’Brien, chaired by Ameera Natasha Moore. The top speaker was Tejaswini Krishnaprasad from Durham C, with an average of 81. The top ESL speaker was Lucía Arce (also the 2nd open speaker) with an average of 80.8. The top novice speaker was Anita Carroll, from Edinbabes, with an average of 79. The breaking Judges were Ameera Natasha Moore, Rebecca Meredith, Rory Flynn, Gillian Tiley, Bexley Brown, Sophie Furlong, Isabella Craig, Nicole Liu, Doireann O’Brien, and Raluca Vacaru. The Chief Adjudicators of the Cambridge Women’s Open were Rebecca Meredith, Ameera Natasha Moore, and Rory Flynn. The tournament ran over the course of a single day, with 4 preliminary rounds of 5-minute speeches and 10-minute deliberation time followed by to elimination rounds with 7-minute speeches. The tournament was tabbed by the team of Alex Murray and Joseph Sisson. The convenors were Maria Epishkina and Tatiana Kurschner.